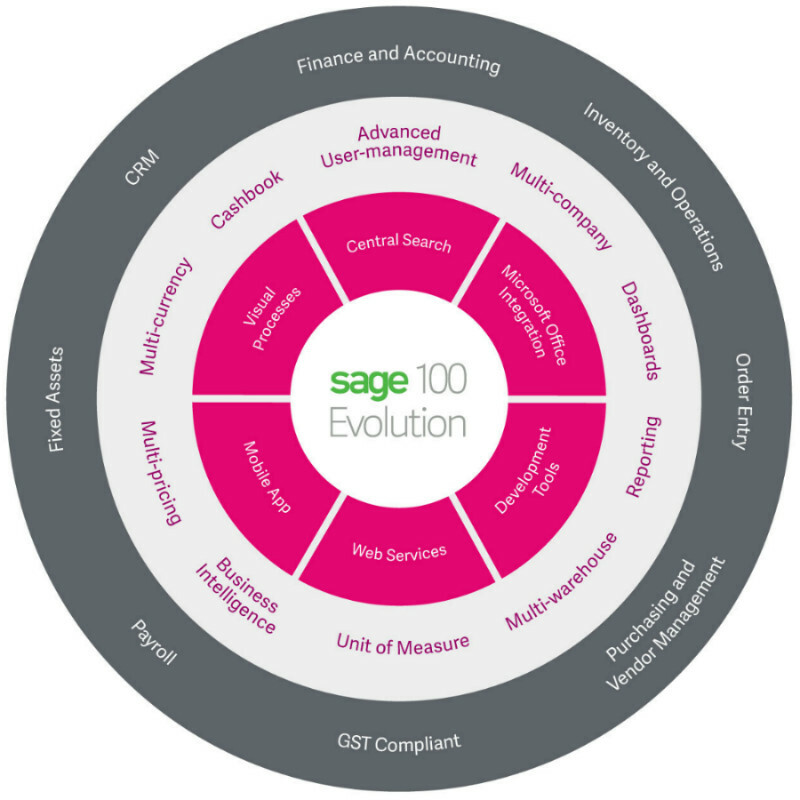 Sage 100 Evolution is a powerful accounting and financial management software solution that allows small and medium-sized businesses maximise operational efficiencies, enhance business intelligence and drive productivity. Sage 100 Evolution helps companies like yours manage their finance, operations, inventory and sales without the need of a full-scale ERP solution. Sage 100 Evolution empowers companies like yours to meet changing business needs with a comprehensive business management platform. It is designed to give you the most complete and accurate view of your business both from a financial and operational perspective. As companies continue to grow and evolve, so do their complexities. Sage 100 Evolution provides the tools and capabilities to enhance business intelligence and meet complex financial requirements at any level. Control costs and simplify your purchase order process. Get complete control and visibility of your inventory. Empower your sales force by allowing them to transact anywhere, anytime and stay ahead of the competition. Sage 100 Evolution’s Mobile App allows sales executives and management to view customised dashboards and information on customers, inventory, expenses and other key business information in real-time. Make better, faster decisions with powerful business intelligence. Sage 100 Evolution comes with Sage Intelligence Reporting a Microsoft® Excel® based Business Intelligence (BI) tool that makes customising and distributing reports simple and easy. Track all customer and supplier transactions in your system. Manage your projects by capturing budgets for each project and track all income and expense transactions against projects. You have the ability to generate a report that shows profit or loss for each project. Improve your cash flow, tighten up debtors control and save time with Sage 100 Evolution’s Debtors Management. Sage 100 Evolution can help your business minimise tax penalties and fines. This built-in feature means that your Sage 100 Evolution automatically ensures your business stays compliant – allowing you to save time and simplify your operations. Track your capital expenditures and calculate depreciation accurately using the Fixed Assets module of Sage 100 Evolution. Integrated with Sage 100 Evolution, Sage 300 People offers the next generation feature-rich payroll, employee self-service and HR capabilities in a single-instance solution. Using this solution, you can capture all pay related transactions in your Sage 100 Evolution’s general ledger.